Floristics, like everything in our life, is influenced by fashion. And when we think what flowers to choose as a gift, we really want our choice to reflect feelings, emotions and was stylish, fashionable, original and memorable. Not only the flower itself, but also how the bouquet is made, what kinds of flowers and shades it is made of, and what is given, is determined by fashion. What trends in the world of flowers will be fashionable next year? Bouquets in the style of boho, rustic and shebbi chic will continue to enjoy success and popularity. What are they? Bohho is a mixture of several directions, in which you can see folklore, hippies and urban motifs. It reflects love, a flight of fantasy, a wind of freedom, and tradition. Bouquet in the style of the Boho to look fashionable, should be drawn up according to certain rules: light negligence and dishevelment, a combination of wildflowers and traditional classic in pastel shades. It expresses mood, harmony and uniqueness. At the heart of the Rustic style lies the elegant simplicity of natural types of flowers and a natural color palette. Such bouquets harmoniously look like wildflowers - bells, chamomiles, cornflowers, sweet peas, and grown garden - pion-shaped and classical roses, daisies, sunflowers and peonies, hydrangeas and daisies. The style of the cheby chic involves the use of colors of muted shades - pale pink, beige, peach, mint. This combination of solemnity, classical elegance, ease and aristocracy. The highlight of such a bouquet will be a velvet ribbon or cameo as an ornament. You can already guess that the fashionable color in floristry will continue to be pink. Therefore, if you want to be considered expert in the fashion world and aesthete, boldly choose flowers of white and pink for the bouquet. However, no one canceled fashion for contrasting compositions, in which bright sunny colors of various natural colors will be present. 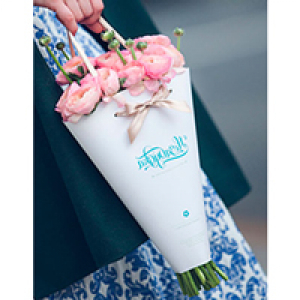 The main thing is that the bouquet is harmonious and composed with taste. In this you can fully trust the florists of the company for the delivery of flowers in Kiev. No matter how the fashion changes, the rose will always be popular. The classic mono-bouquet of roses still looks harmonious and stylish in any situation. In addition, in flower arrangements or in bouquets of flowers of one kind, pion-shaped roses, hydrangeas, and raunculus are increasingly used (if you can not pronounce it from the first time, do not worry - it's just a buttercup), peonies and anemones. Modern floristry offers a huge variety of options for filing bouquet compositions. The usual cellophane is a thing of the past and is no longer interesting. You can wrap a bouquet in kraft paper or simply bandage it with ribbon, present flowers with an envelope, in a basket or in a hat box, create a flower-cake composition for lovers of sweet, present in a nice flower pot or stylized pail with a vase. Your fantasies will make the bouquet unique and unforgettable. Dare and be in the trend!